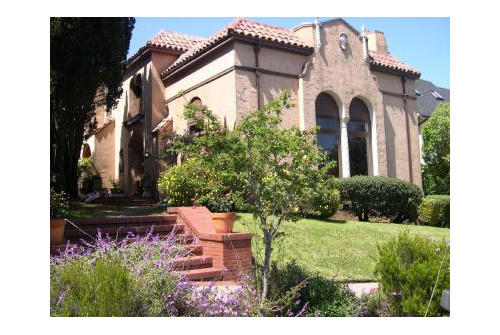 This home is an outstanding grand scale Spanish Mediterranean work of art located in the desirable Windsor Terrace. There is a feast for the eyes at every corner: amazing formal entry way with beamed ceilings, grand archways, and wrought iron balconies. The stunning living room has soaring ceilings and an ornate fireplace. This room evokes the grandeur of Hearst Castle. The dining room looks out to a south facing courtyard and overlooks a lovely fountain. Off the dining room is an elaborate iron gate which leads to a solarium with an indoor fountain. There is a guest room and a full bath on the main floor. On the upper level is a grand master suite with an interior balcony overlooking the living room. There are also 2 additional bedrooms, a sunroom, and 2 full baths upstaris. This home is a one-of-a-kind rare find. You’ll be transported back to an era of days-gone-by. This elegant home is a true work of art.